While many people think the cold and flu season only comes once a year, the truth is, sickness can strike at any time. And when the flu hits your home, there is nothing more important than getting better. Since the flu can hit hard and last up to two weeks, taking action early can make a big difference when it comes to supporting your immune system to fight the flu naturally. Of course, fighting the flu first starts with prevention. Poor nutrition, being run down or stressed, and getting too little sleep all can make you more susceptible to getting sick. It’s important to prioritize a nutrient-dense diet, supplement with immune-boosting nutrients (more on that below! ), and protect yourself from becoming run down and sleep deprived in order to stay healthy and well all year long. When you’re out and about, make sure to follow proper hygiene practices. Wash your hands thoroughly with warm soap and water after accessing heavily touched items like shared pens, credit card machines, and gas pump handles. Avoid putting your hands near your eyes, nose, and mouth when in public. When flying during cold and flu season, consider wiping down the arm rests, seatbelt, and tray table with germ-fighting wipes (yes, I do this, and most of my fellow passengers ask if I have extra wipes). And of course, always wash your hands before eating or drinking. But alas, even with proper prevention, sometimes a cold or the flu takes us down. If the flu does find you or your family, here are ten natural ways to fight the flu and feel better fast. 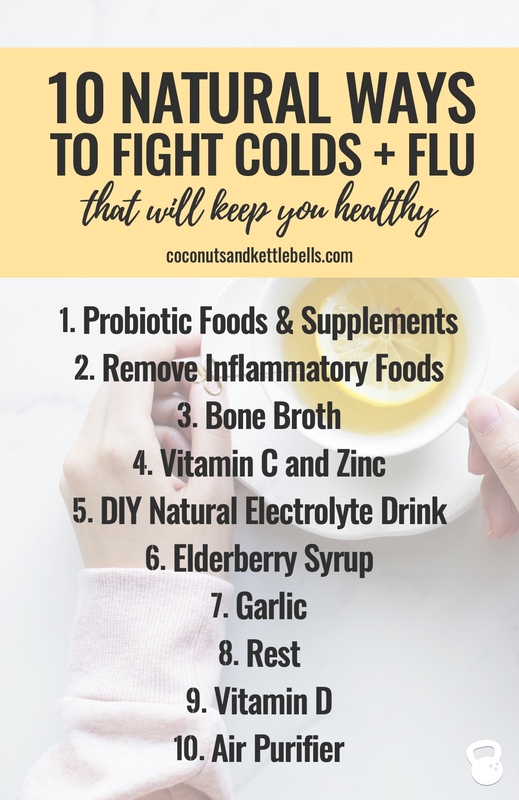 Note: While these ten natural cold and flu remedies are important for helping you get over sickness, they are also things that you can do throughout the winter months to boost your immunity. If you’re traveling, sharing a household with people who are sick, or your job requires you to be around a lot of people (like retail), I recommend doing some of the things listed below to help support your immune system. Your gut is home to 70% of your immune system. So it’s no surprise that when it comes to fighting the flu naturally, it starts in the gut. Fermented foods are the best and most diverse source of probiotics. By incorporating probiotic-rich foods such as kefir, kombucha, sauerkraut, or kimchi, you’ll improve gut health and give your immune system a powerful boost to recover from the flu faster. I also recommend supplementing with a high-quality probiotic supplement regularly, and upping the dose when you are sick or have to take antibiotics. Certain foods can negatively impact gut health and actually suppress your immune system. Both refined sugar and processed grains can cause inflammation in the gut and leave you more susceptible to getting sick. Other common gut irritants and foods to consider removing while you heal from the flu include vegetable oils, caffeine, and dairy. 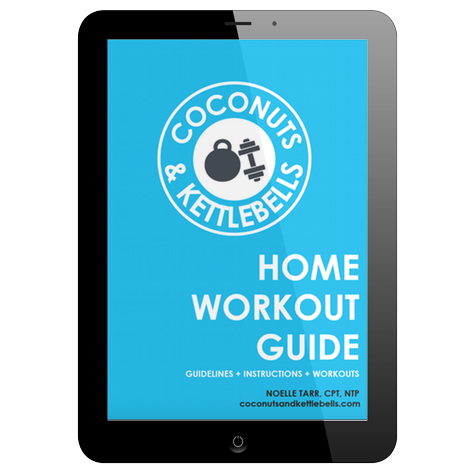 For more information about how to figure out what foods might be problematic for you, check out Coconuts and Kettlebells. When bones from pasture-raised or grass-fed animals are simmered in water for up to 24 hours, they release gut-healing compounds including glutamine and collagen. 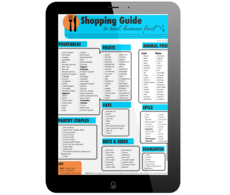 Bone broth is also packed with important minerals and electrolytes like calcium and magnesium. Getting adequate fluids in during the flu is critical for recovery, and bone broth contains protein and fat, which is important if you are otherwise unable to stomach solid foods. If your kid is sick with the flu, a cold, or the stomach bug, shift immediately to bone broth to help them heal and stay hydrated. While it’s easy to make homemade bone broth, I always have Bonafide Provisions bone broth in my freezer for when sickness strikes. Vitamin C and zinc are two critical nutrients that boost immune function and help the body fights infections like the flu. If you start to come down with early symptoms of the flu, you may be able to ward off sickness by loading up on vitamin C and zinc. Fill your diet with vitamin C and zinc-rich foods such as oranges, bell peppers, broccoli, kiwi, spinach, and tomatoes. Throughout the winter, supplement with high-quality vitamin C and zinc, especially if you’re around sick people or pregnant. If you start to feel sick, take as much as 1000 mg daily of vitamin C, and continue until your symptoms disappear. One of the best things you can do for your health when you’re feeling sick? Hydrate. Be vigilant about getting in enough water. It’s also important to make sure you are consuming electrolytes, which are minerals needed for water to be properly absorbed into cells. Water helps flush toxins out of the system and can help thin mucus to alleviate uncomfortable symptoms like post-nasal drip. I recommend making your own DIY Natural Electrolyte Drink, and using lemons in the recipe for an added vitamin C boost. Black elderberries contain antioxidants and immune-supporting compounds. There’s been a plethora of research, including double-blind placebos, that show that supplementation with elderberry extract significantly reduces the duration of colds and the flu. Most commonly used as a syrup, lozenge or tea, studies also suggest that elderberry is most effective if taken within 24 to 48 hours after symptoms begin. It’s incredibly easy to make elderberry syrup on your own using dried elderberries and raw honey. I personally use this recipe from Wellness Mama. For prevention, supplement with elderberry syrup daily to reduce your risk of contracting illness. Garlic has potent anti-inflammatory and anti-fungal properties that can help you fight the flu. Both raw garlic and garlic supplements have been well-researched, and garlic has been used for centuries to boost immune function. One study found that when healthy individuals supplemented with garlic during the cold and flu season, they had a 63% lower risk of getting a cold, and their colds were 70% shorter. Consider using a high-quality allicin-containing garlic supplement throughout the winter, or make an at-home remedy with raw garlic by consuming 1-2 cloves of crushed fresh garlic mixed with 1 tablespoon of raw honey. 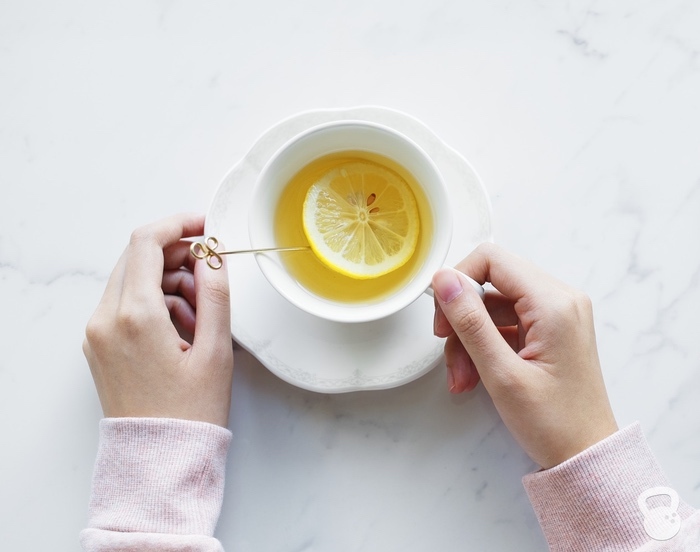 If taking garlic straight isn’t your thing, try this garlic honey lemon tea recipe, which has the added benefit of soothing the throat with honey and boosting vitamin C with lemon. The flu is not the time to be a hero in the gym or at work. In fact, when you’re sick, it’s important to take time off from working out. Not only will your workout buddies and colleagues appreciate you keeping your germs to yourself, you’ll also reap the benefits of recovering faster. Your body needs 8-9 hours of sleep per night because your immune system is fighting a fierce battle. It’s also important to rest as much as possible when you’re awake, so consider it a good excuse to curl up and binge your favorite Netflix series. Research has found that vitamin D supplementation significantly reduces your risk of experiencing the cold and flu and upper respiratory tract infections. In addition to incorporating foods that contain vitamin D such as fatty fish (salmon), egg yolks, and grass-fed meats, butter, and cheese, it’s also important to supplement during the winter when your exposure to the sun is reduced. When supplementing with vitamin D, use a high-quality vitamin D supplement that contains vitamin K, as vitamin K is needed for proper absorption. Children over the age of 1 need around 600 IUs a day. Adults need anywhere from 2,000 – 5,000 IUs a day (especially if you are pregnant). Air purifiers can be a bit of an investment, but are well worth it if your household is regularly getting sick, or if you live in an older home that may have mold or other toxins. An air purifier with a true HEPA carbon filter and UV light will help you breathe easier and keep the home free of germs. Consider also using a humidifier to help you breathe easier too, especially at night. These natural cold and flu remedies can help you feel better fast when you’re down for the count. Of course, be sure to contact your trusted healthcare provider if you suspect you or your family has the flu. Do you have any other natural flu fighting tips or remedies? Share below!